The Welcome Bap is part of Chard Baptist Church, which is a church reaching out to locals and visitors with the gospel of Jesus Christ. We start each morning with prayer: for the day ahead, and for prayer requests that have been made via our prayer box. The Welcome Bap was opened over 20 years ago to give a window to the Church, to build bridges into the community and provides work experience for students and others. 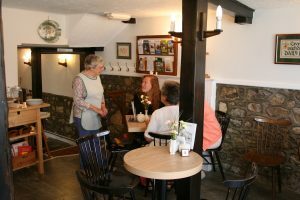 The cafe is staffed by volunteers from various walks of life, with many coming from beyond Chard Baptist Church. The name speaks of our welcome, and the Bap – well, could be the wonderful bacon baps we serve, or a shortened version of ‘Baptist’. Whichever you prefer, we look forward to meeting you. Outside of opening hours, the building is used for Alpha courses and other small meetings. A warm welcome awaits you. We are child friendly, and also offer facilities for the disabled. We offer a meeting place for friends, time for peace and quiet, and there is also someone on hand should you wish to have a chat.